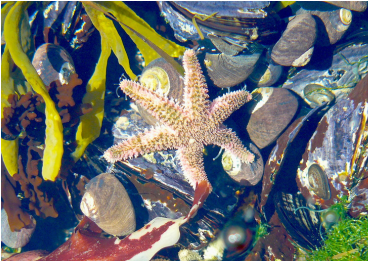 Sea star wasting disease (SSWD) devastated populations of the intertidal predator Pisaster ochraceus along the East Pacific Coast beginning in 2013 (Menge et al. 2016). Though unfortunate, it is an ideal natural experiment because it caused the removal of species over a massive geographic area. Decades of research show that Pisaster is the archetypical “keystone species” and can control the biodiversity of the intertidal ecosystem by eating mussels, thereby freeing up space for other animals and algae. Will we see a coast-wide takeover by mussels and subsequent decline in biodiversity? So far, we are seeing takeover by mussels in some places and not others, showing that things like mussel recruitment and growth may be prerequisites to keystone effects, and that the keystone concept may not apply everywhere. These systems also appear somewhat resilient to the outbreak, because an unprecedented number of young stars have arrived on shore. 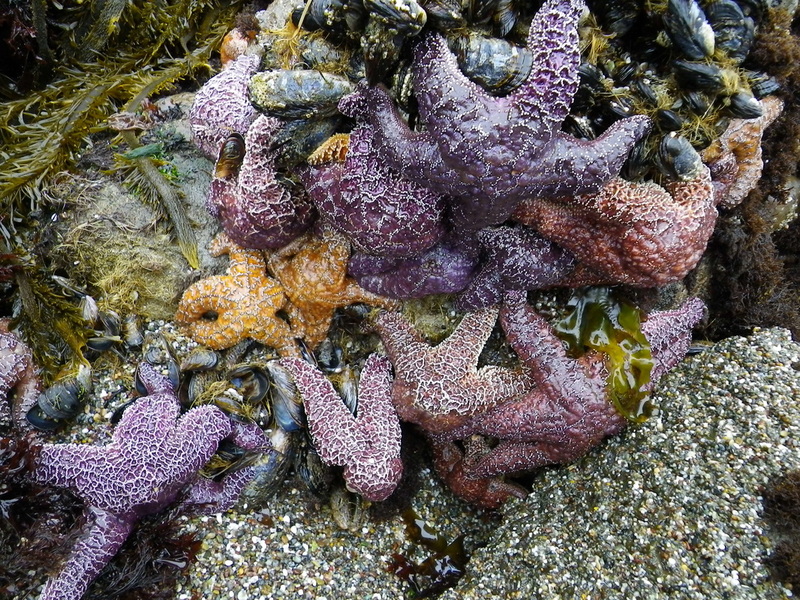 In collaboration with a diverse group of academic and agency scientists and wildlife managers, I am leading the Sea Star Wasting Task Force, which is drafting A Collaborative Strategic Action Plan for Sea Star Wasting Disease Research and Management with support from the American Association of Fish and Wildlife Agencies (AFWA) and the BAND Foundation (bandfdn.org). This Task Force will enable tight collaboration between scientists working on all aspects of the disease. The next step is to involve a more diverse group of stakeholders including non-governmental organizations, government agencies, and aquarists and aquaculture specialists, among others. A second workshop is planned for summer 2018. Ultimately, we hope to use SSWD as a case study detailing best practices for studying and managing marine wildlife disease outbreaks and help draft legislation similar to the The Marine Disease Emergency Act. Increasing temperatures may differentially affect predators and prey, making it hard to predict which will "win" in the future. I performed a 6-year removal of the keystone predator Pisaster ochraceus and the subordinate predatory snail Nucella ostrina from replicate boulder communities, allowing me to experimentally determine how climate change may influence key predator-prey interactions. Since the intertidal exhibits such strong vertical gradients, I also investigated how abiotic and biotic interactions influence vertical limits of mussel beds. I found that the key Pisaster-Mytilus californianus interaction is strengthened by increased wave action but weakened by warming air temperatures because mussels die of heat stress. Further, increased temperatures appear to “squeeze out” mussel beds and may cause range contractions. What will intertidal communities look like in the future? Climate change will place new stresses on organisms, and since organisms are embedded in complex ecosystems the results are not always predictable. Since it is impossible to manipulate climate conditions in entire communities to test for future outcomes, I used replicate gradients in temperature and wave exposure around large intertidal boulders as a space-for-time substitution to indicate potential future communities. ​I found that warmer air temperatures favor barnacle-dominated communities while mussel- and algae-dominated communities may become less common. Predators do not only eat prey. They scare prey too. In tide pools the small six-arm seastar Leptasterias sp. preys on the common snail Tegula funebralis, which eats algae. By manipulating snail and seastar presence in tidepools for 10 months, I found that seastars positively affect macroalgae growth by scaring snails out of tidepools and causing them to graze less. This is a "trait-mediated indirect interaction" (TMII) since seastars indirectly affect algae not only by eating snails but by changing snail traits (behaviors). It is well known that individual behavior depends an an individuals traits such as size and hunger level. So I investigated how individual variation in behavior scaled up to influence community-level processes by testing how snail size and hunger level affected the strength of the TMII between seastars and algae. I found that seastars had the strongest positive TMII on algae when snails were medium sizes because snails readily escaped seastars and ate enough to strongly affect algae. 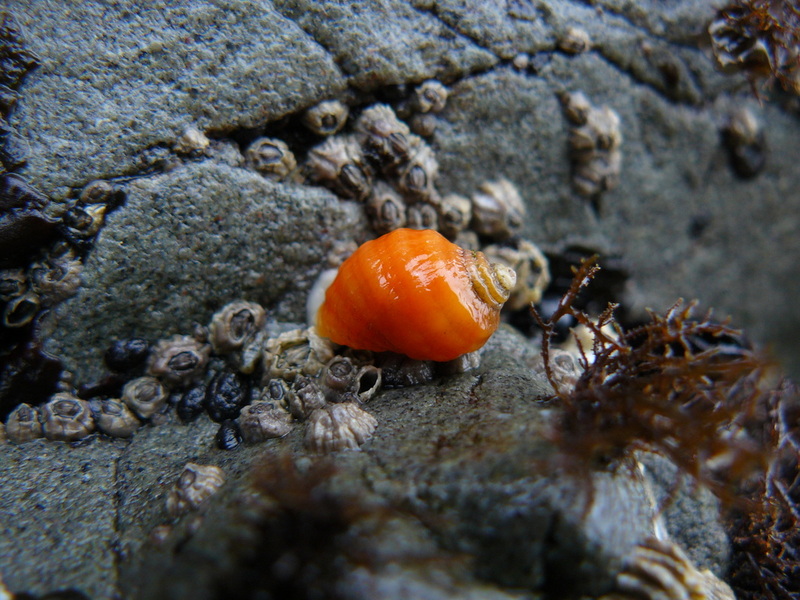 When snails were small the TMII was weak because small snails had little affect on algae. The TMII changed with hunger level too; seastars strongly benefitted algae when snails were fed because fed snails fled. The benefit disappeared when snails were hungry because snails continued grazing regardless of risk (Gravem and Morgan 2016). Mass mortalities, though unfortunate, provide insight into ecological processes. They are more expansive and permanent that caging experiments because they do not only remove mouths from an area but remove chemical cues that organisms use to sense one another. Sequential mass mortalities of two predatory sea star species Leptasterias sp. then of Pisaster ochraceus from Bodega Head, CA allowed us to compare prey responses to each predator. We found that after Leptasterias died their prey Tegula funebralis became 3 times more abundant, moved downward on shore, and increasingly inhabited tidepools in which Leptasterias tended to hunt during low tide. All of the these trends were driven by smaller snails that are more vulnerable to Leptasterias but not by large snails that are rarely eaten. After Pisaster died we expected a similar numerical and behavioral response, especially by large preferred snails, but no such responses occurred for any sizes of snail. This was surprising since Pisaster had been formerly implicated in controlling Tegula populations and zonation. This natural experiment indicated that 1) predators exert top-down control over prey population sizes and lower limits, 2) vertical zonation of prey are dynamic and controlled in part by prey behavior, and 3) predators exert the strongest effects on more vulnerable individuals, which typically inhabit stressful habitats higher on the shore or outside tidepools to avoid predation.